Sometimes a little help goes a long way. Boxing Day 2015. I was going through the recyclable bin in search of some instructions that were reported missing from my littlest girl's "Frozen" Lego set. I kid you not! I noticed a guy with his two kids and a kite at the park. I paused to watch, like any kiter would do. I watched them struggle to get it into the air. I saw the kids lose interest. I had a déjà vu from exactly 4 years back. Quickly told my wife I was just going to help them out and over I went. Went and introduced myself and offered some assistance which he readily accepted. I gave the kite a once over. It was a cheapo dualile, would've cost $20 at most. Plastic sail, cheap lines. First I gave him a basic run through, let out all the lines when it's down on the ground not in the air. Give to the kite if you heading South to the ground. Small hand movements not massive arm yanks. After a couple of minutes of successful flying, there was a gust that just stretched out the sail in a very unkind way. I quickly ran ran back to my house and grabbed my SKD Seven Std and 80 foot lines. Quickly set up, explaining what AND why I was doing. A quick flight to make sure the bridle was dialled in. Then handed over the straps. All the frustration just melted away from his face. Sure we didn't do any tricking, just flew around. But! He was flying and not struggling. His kids called out to him that it was time to go so he handed me the straps back and I flew a few figures, stalls and slides for a bit of fun. We talked while I packed up. All about kites. I think I opened his eyes to a lot more than a $20 dollar kite. Then, and there is always a then, he asked me how much my Seven was. The smile didn't disappear totally from his face when I told him... I explained that it was an investment over a few years. Break the cost of kites down over a few years and most people see the value. I pointed him towards Kitelife.com as a portal into kiting. 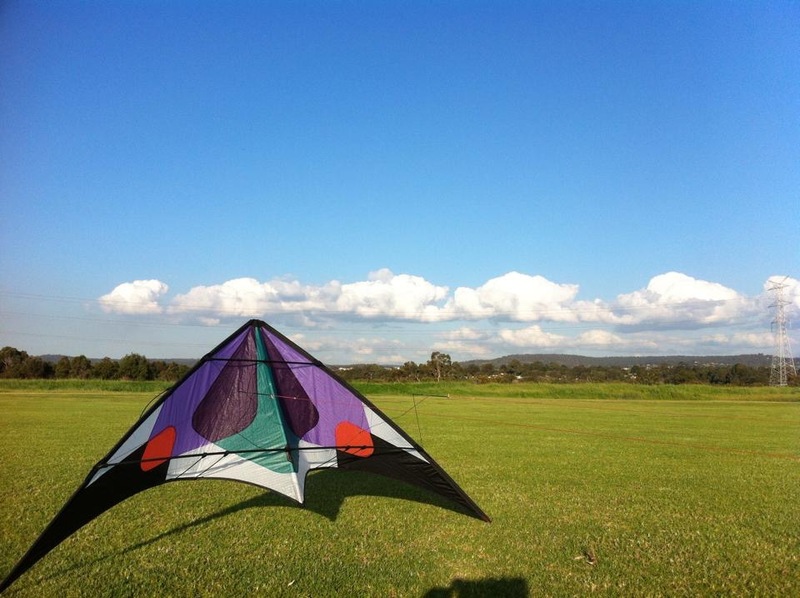 Gave him a website for a kite shop here in Oz. Gave him my details. Hopefully there was enough of a spark to keep going. Only time will tell. Previous entry How I got started with kites. "Linux - because Mommy taught me to share"
"Kiting - because Mommy taught me to share!" Not nervous at all. I've lawn darted it before... Holes can be patched. Sticks can be replaced. And it was the easiest to grab at the time. Even my Rasta Jammin is capable of more than me at the moment but the Sevens are just really nice to fly.